Before you or anyone else studies the book of Job you should at least know how things begin but that is not what has been done here. Instead, we are given John 11:25 as a memory text that provides no indication of why God allowed the trials that Job faced in the book of Job. Martha replied in the affirmative. Therefore, according to Jesus' words to her she never would experience the death Jesus was talking about. 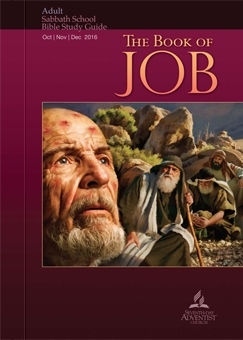 While this does raise some interesting issues for those whose lives are centered around Adventist theology, this certainly is a poor way to introduce a person to a study of the book of Job. Then Job answered the LORD and said: “I know that you can do all things, and that no purpose of yours can be thwarted. What Job learns and expresses in his repentance is the same we must all know and acknowledge. When you know in your heart that you also cannot answer the questions God put to Job in the book of Job chapters thirty-eight through forty-one you will also become a person who knows that God is and can only be totally, without any limits of any sort, absolutely sovereign. Whatever else you may see in the way of sub-themes in the book of Job you must acknowledge God's infinite sovereignty in the same way Job does. There will come a time where every knee shall bow before Jesus for the glory of God the Father, Rom. 11:14; Phil. 2:10-11 & Isaiah 45:23. Sunday, Sept. 25: Happily Ever After? Today's theme passage, Job 42:10-17, begins with the phrase; 'And the LORD restored the fortunes of Job, when he had prayed for his friends.' and ends with; 'And Job died, an old man, and full of days'. A righteous person regardless of the degree of health and wealth or fame they have experienced in this life dies in peace full of assured hope knowing that he/she will live happily ever after. "As we can see, the Bible is full of stories that don’t have happy endings. And that’s because life itself is full of stories that don’t have happy endings. Whether martyred for a good cause, or dying from a horrible disease, or having a life reduced to pain and misery, many people don’t come through their trials as triumphant as Job did. In fact, to be honest, how often do things work out well, as they did for Job? And we don’t need the Bible to know this terrible fact. Who among us doesn’t know of unhappy endings?" Today's lesson parallels that of yesterday. If you are someone whose sins have been covered by the blood of Jesus Christ shed at Calvary you are safe within the kingdom of God. Regardless of the trials, sickness or suffering you have experienced your life does have a happy ending. Long life, good health, riches or fame are not the measure of a life that has a happy ending. The above lesson quote contains claims that must be confronted for the wrongs they teach. With certainty we often do need Scripture to separate fact from fiction, especially when we are experiencing and troubled with the worse of trials. Each and every saint of God should know that their lives do have a happy ending because they can never be separated from the love of God and the promises of God. "And, as far as we know, Job never learned of the reasons behind all the calamities that befell him. Yes, he got more children, but what about his sorrow and mourning for those whom he lost? What about the scars that, no doubt, he carried for the rest of his life? Job had a happy ending, but it’s not a completely happy ending. Too many loose ends remain, too many unanswered questions." In the underlined portion the "we" are those Adventist scholars including the author who wrote this quarterly lesson. They are the ones who don't understand the "reasons" for all that had befallen Job. Instead of seeking understanding speculation is made on "the scars that, no doubt, he carried for the rest of his life". Speculations, no matter how scholarly sounding, can not reveal the mind of God. Most assuredly, how Job responded to the trials Satan inflicted upon him was fully in the mind of God when he challenged Satan. God was not 'winging it' and reacting to a developing situation. The only possible way to understand God and his purposes is for us to know and understand his inspired holy Scriptures. And it is one of the roles of the Holy Spirit who indwells born-again saints of God to provide that understanding, John 16:12-15. Job 42:1-6 reveals that Job did understand what God was teaching him. He did learn the reason for the calamities that had befallen him. While this is hard at times to grasp it is profoundly simple; God is sovereign. "Indeed, the book of Job ended with his death. The good news for us, and for Job, is that the end of the book of Job is not the end of Job’s story. And our death is not the end of ours, either." Neither our faith nor Job's can be placed upon anything other than Jesus Christ. There is nothing we do that can be added to the salvation of any of us. Job's faith was not founded upon himself when he fell upon his knees and repented of that very thing....self. Therefore since "Jesus is the founder and perfecter of our faith" let us lay aside all other writings and place our faith, our understand of the word of God, upon only what is revealed in the Holy Scriptures. If we want to understand God's purpose for Job we must start by understanding God's message to be found recorded in the book of Job. "One of the themes in the book of Job deals with the question of death. How could it not? Any book that looks at human suffering would, of course, have to look at death, the source of so much of our suffering. Job asks if the dead will live again, and then he says that he waits for his change to come. The Hebrew word for “wait” also implies the idea of hope. It’s not just waiting for something, it is hoping for it." The lesson author seems to have things backwards. For a righteous person, death is the end of suffering. As for the condition of the righteous dead prior to the coming resurrection, who are you to believe? Will it be Ellen G. White or will you turn to Scripture and find Jesus' promised comfort before your death? "And though today we have the privilege of knowing “present truth” (2 Pet. 1:12) and certainly have been given more light on issues than Job had, we still have to learn to live with unanswered questions too." Question: What is the truth of Adventist "Present Truth"? While Adventism stresses certain things such their version of Sabbath Keeping and what is called the Health message, the one unique doctrine that sets Adventists apart from all those who simply claim Jesus Christ as their Lord and Savior is what is variously known as Investigative Judgment and/or the Sanctuary Doctrine. Historically and biblically the Day of Atonement has always been determined by the Jewish religious leaders (Levitical priests or Rabbis in modern times) by first knowing the Jewish New Year date, Rosh Hashanah. In 1844 this put the beginning of Day of Atonement on the evening of September 22nd and ended on the evening of September 23rd. William Miller, subsequently, Ellen G. White had the wrong date regardless of the year picked. Jesus has been located in the holiest possible place for there to be in the universe or heaven for nearly two thousand years. Nothing happened in heaven on Oct. 22, 1844. Here on earth, following this "Great Disappointment" only fools failed to repent of their error. Since the foundation for Adventism is untrue and not founded upon Scripture there can be no truth in their "present truth" intended to support this false doctrine. It should also be noted that the quarterly lessons for this week are a poor way to begin a serious study of the book of Job. Copyright 2016 BibleStudiesForAdventists.com. All rights reserved. Revised September 21, 2016. This website is published by Life Assurance Ministries, Camp Verde, Arizona, USA, the publisher of Proclamation! Magazine. Contact email: BibleStudiesForAdventists@gmail.com.